The judging panel for Marie Claire will be judging entries on quality of writing, insider knowledge in your chosen field & style. 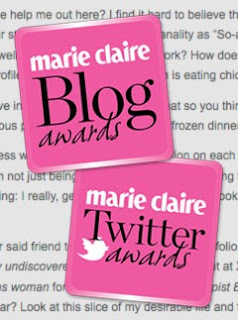 Readers, tweeters and bloggers can nominate blogs and Tweeters throughout December. The Marie Claire team will compile a long list that will be published on marieclaire.co.uk on 9th January 2012. Voting will take place until 20th January and the winners will be announced at the end of the month. This is awesome,this gon be easy one for me,I have Dolce Vanity on top of my list!